I will say something briefly about the disappearance day of Srila Prabhupada. To a certain extent for many of you, this tirobhava is more of a festival day. Of course, by transcendental arrangement, you may enter into some mood where you’ll find a connection to Srila Prabhupada and find his grace there. You can have a sense and feeling of Prabhupada’s grace by performing his puja, singing his glories, dancing in front of his samadhi, and so forth. But actually you can’t know what happened on this day 25 years ago and what led up to that unless someone tells you. Every morning, Srila Prabhupada would come down to the temple room for what is called ‘Greeting the Deities.’ After greeting the Deities, he would walk to his vyasasana which was directly opposite the Deities, at the very back of the kirtana hall, then there was guru-puja. We would offer arati and sing the song Sri Guru Carana Padma. When that was over, Srila Prabhupada himself would say the jaya-dhvani prayers and then devotees would sit down and he would sing Jaya Radha-Madhava, and give Bhagavatam class. After the Bhagavatam class, the devotees would start the kirtana again and Prabhupada would go around the Deities 3 times. On each side of the altar there was a big bell and when he would come to the bell-rope, someone would give him the rope and he would ring the bell and the kirtana all around him would become more and more ecstatic. Devotees would be airborne and some of them didn’t come down – they just stayed up there. Prabhupada liked to see all the devotees jumping. It wasn’t just children jumping – many of those devotees were 30-40 years old. Prabhupada especially liked to see Brahmananda Prabhu, who was 200 pounds, jumping. After that, the kirtana would come outside as Prabhupada would go to this room. That was the normal morning programme. But on this particular day when Prabhupada came down, he did not seem his normal self. He greeted the Deities, went to his vyasasana and there was guru-puja. But after the guru-puja he didn’t sing. We noticed on that day that Srila Prabhupada didn’t look well, so to speak. He looked what we would call ‘withdrawn.’ Instead of singing himself, he called for one of his servants to sing, but that devotee wasn’t there at the time. Then he called the name of another devotee to sing – that devotee was also not there. Then he called the name of another devotee to sing and that devotee was also not there. Actually all those devotees were present in Mayapura, but they just weren’t there in the temple. After asking 3 devotees to sing, Prabhupada didn’t say anything – he just put his head down and shut his eyes. It seemed that he became a little sad that they weren’t there. Then one devotee leaned forward and asked, “Prabhupada, should can sing?” Prabhupada just nodded his head and said, “Yes, you can sing.” So that devotee sang Jaya Radha-Madhava, and after the bhajana was over, Srila Prabhupada got up and he went to his room. There was no Bhagavatam class and there wasn’t another kirtana. There was maybe a kirtana when he was leaving, but he did not go around the Deities. That was the last time Prabhupada sat on the vyasasana to give class, or anything formal here in India. The rest of the festival he never came down to the temple room. He stayed in his room the whole time, which was another 10 days or 2 weeks. After Gaura Purnima, the hot season comes, so in the month of May, Srila Prabhupada decided to go to Rishikesh with a group of devotees. He stayed there for a few weeks in the guesthouse of a life-member. During the hot season in Rishikesh, it is cool at night and warm in the day. Prabhupada stayed there for a few weeks and was in quite a happy mood. Sometimes he would sit in a chair in the kitchen and give some lessons in cooking. He also taught the devotees a special technique how to get drinking water from the Ganges. You have to take a pot, turn it upside down so there is air trapped inside. Then you dive into the Ganga and go down deep, about 10 foot, then roll the pot over – then it will fill up with water from deep within the Ganga. Then you come up and that is how you get drinking water from the Ganga. Prabhupada had Tamala-Krsna Maharaja and other devotees dive in the Ganga to get fresh water and if it came up with particles of sand or anything, he would say: “No, no, no – you do it again”. Like this, he was having casual pastimes with those devotees, teaching them. But all this time he was very weak and remained withdrawn. He was not his normal self. Then he came back to Vrndavana and from there he decided to go to England. Prabhupada thought, “Preaching is life. Simply sitting around here, feeling like this…let me go for preaching.” The day he went to England, I went to the airport with about 20 or 30 devotees in the middle of the night and we put Srila Prabhupada on the plane and 4 to 6 devotees flew with him. He was in England at the time of Janmastami, and his Vyasa-Puja. I believe he came downstairs only once. He sat on the vyasasana for guru-puja and went back to his room. He did not give any class. But during this time, he still endeavoured to do translation work with his Dictaphone. 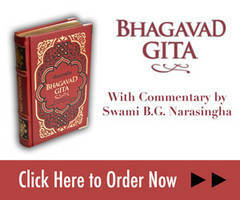 With the help of devotees, he would do some translation of the Srimad Bhagavatam. He was working on the 10th Canto, and he would do that when he had the energy. That was in August 1977. Of course, the devotees in the US, Canada, and other countries had hopes that Prabhupada would also come there, but he didn’t. The last time he went to the United States or any other countries was 1976. In England there was an incident where he had some physical difficulty and the devotees whisked him away to the hospital in an ambulance, but he didn’t like that. He didn’t like that at all. When he got out of the hospital he told the devotees, “You take me back to India immediately. I don’t want to die in these hospitals.” He hated these places. He was concerned that the devotees’ concern would simply be external. They would whisk him away to a hospital and there he may end his life. He didn’t want to end his life in a hospital. He was adamant about that, so they took him back to Vrndavana. At that time I was in Vrndavana when we got the message – “Prabhupada is coming back to Vrndavana.” I had the good fortune to arrange Prabhupada’s room. It was sometime in early September when he came. All the devotees were outside doing kirtana, so when Prabhupada came to his room, I opened the doors from the inside and I was very surprised. Actually, I wasn’t surprised – I was very shocked! Prabhupada had become very thin. Since around the time of the Mayapura Festival, he was only eating 1 or 2 small handfuls of prasadam everyday, so he had become very, very thin. It was a big shock for all the devotees in Vrndavana, to see him so thin like that. Around June of that year, I had also gone to London and I went shopping in Harrods, which used to be the biggest store in the world. I thought I would buy Prabhupada a new pair of shoes. I always had this thinking, “If I buy him a new chaddar, I might get his old chaddar. If I get him a new pair of shoes, I might get his old shoes.” So I went and I looked and I looked, but I could not find the type of shoes that Prabhupada would wear, which was a type of house shoe. Those were out of season because it was summer time and they only sell them in the winter. All I could find was this kind of shoe that wasn’t a house shoe – it just had two straps and your foot goes inside. It wasn’t the kind of shoe that Prabhupada wore, but somehow or other I was drawn to buy those shoes. Anyway, I brought them back to India and I took them to Prabhupada’s room to give them to his secretary, but I was feeling very shy because I knew they were not the kind of shoes that Prabhupada would wear. What happened though was that in those days Prabhupada’s feet had become swollen and there were no shoes they could buy in Vrndavana that would fit his feet. The secretary and Prabhupada’s servant were lamenting, “What are we going to do? There are no shoes for Prabhupada.” Suddenly I showed up at the door with this box and I said, “I bought some shoes for Prabhupada in England.” They opened it and said, “Oh, just what we needed –exactly!” I had also bought the wrong size – they were too big. But because Prabhupada’s feet had swollen, they were fine. Prabhupada used to wear those shoes everyday. Those were actually the last shoes he ever wore. Those shoes are there in his room in Vrndavana in a glass box. That was a good thing for me. I got to do that service to Srila Prabhupada at that time. Then the situation became quite serious. There was no improvement. Daily, Prabhupada just seemed to go down, withdrawing more and more. He talked constantly about leaving this world and going to Krsna, and of course, this was very disturbing for the devotees. It became known that certain things would keep him in this world – the Holy Name of Krsna, good reports of sankirtana, and other such things. So at one point, I jumped in a truck and I went to the Himalayas to do some sankirtana and I sent Prabhupada some pictures. When anybody sent a picture or a report from Africa, Brazil, Hawaii, Europe, Russia – any report that came about preaching, they would bring that to Prabhupada and they would read to him how Krsna consciousness was spreading in the world. When he would hear that, he would become enlivened, and then, almost immediately, he would come back down again. This became a constant battle – to keep Prabhupada interested in being in this world, because as soon as it became quiet, or if it took a turn, his interest was only to leave this world. At that time we were all very neophyte – we’re still neophyte, but then we were very, very neophyte and not able to understand what we call the ‘pastimes of departure.’ No one could properly understand what was Prabhupada’s mood, and there were mixed feelings about what should be done, how to do things and so forth. It just made everybody more and more attached to Srila Prabhupada at that time and naturally, it came to the point that the devotees were willing to try anything. Prabhupada would not take allopathic medicine. He would not take tablets; he would not take anything from modern medicine, although he was a chemist in his young life. Once he became a sannyasi, he never touched any of that. He hated scientists, because they’ve got the world by the neck and they are squeezing the life out of everyone, putting them in factories in the name of nice cars and all these things. They are actually sucking the life out of people. Prabhupada would only accept Ayurvedic medicine. Srila Prabhupada mentioned one night that he had a dream that an Ayurvedic doctor with big Sri Vaisnava tilaka gave him some medicine. Immediately devotees left Vrndavana and searched the whole of South India within a few days, going to every Ayurvedic doctor they could find until they found one wearing tilaka. They grabbed that man, put him on an airplane, flew him to Delhi and took him to Vrndavana. But again, nothing seemed to work. The devotees became more and more concerned and worried. Then at a point, 24-hour kirtana started. Over 100 of Prabhupada’s temples were doing 24-hour kirtana. This went on for months and months nonstop. The kirtana in Prabhupada’s room was very soft with one small pair of kartalas and 3 or 4 devotees singing or reading from Srimad Bhagavatam in Sanskrit and English. When the reading would stop, then kirtana would start up again. Around 10:30 or 11 o’clock at night, everything would stop in Prabhupada’s room and the kirtana would go on in the temple all night long. A few devotees would sit with Prabhupada all night, and if he needed anything they would do that. Again, I was very fortunate – I had the opportunity to spend some nights there, taking care of Prabhupada from 11:00 at night until 4:00 in the morning. Generally at that time he wouldn’t say anything, but if he needed something, we were there to serve him. Then they asked Prabhupada, “Was there a problem? Then they went searching for another person to give massage. The next day they brought in another Vrajavasi – they bought him a new kurta, new dhoti, he was clean-shaven and perhaps the devotees might have scrubbed that man’s fingernails also –he was shining from head to toe. He came forward and then Prabhupada looked, nodded and gave the ok. Then that man gave some massage, but again these things were very external. Prabhupada did not have any disease. 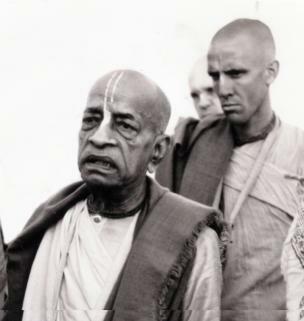 The disease of Prabhupada was vipralambha – separation from Krsna. Many years later I read a description of Gadadhara Pandita. After Caitanya Mahaprabhu left the world, Gadadhara Pandita was here for some years, and he was overwhelmed with feelings of separation and gradually, he himself also left the world. The description of Gadadhara Pandita that I read, almost perfectly fits the description of the symptoms of what we saw in Srila Prabhupada. Srila Prabhupada didn’t take any medicine, but now and then a doctor would come, but none could say what’s his disease was. There was no explanation. Of course, they could say that his blood pressure was down etc., but what was the cause of it? They could not offer any cause. The actual cause was his feelings of separation from Krsna and that was the cause of his withdrawing from the world. These astrologers always prescribe you need some jewellery, and naturally their brother or cousin is always a jeweller! So he prescribed that Prabhupada needed an emerald and the next day one devotee was off to Japan and came back with a green emerald the size of your thumb. He purchased an emerald for U$12,000 dollars. Prabhupada thought: “This is absolute foolishness.” I think they put it on a ring. Prabhupada wore this big ring for maybe a day or two and said: “This is nonsense!” Anyway, eventually somebody got $12,000 dollars worth of maha-prasad. Where that emerald ended up I don’t know. Then it became very sad. Prabhupada started giving away his personal things – his watch, his tilaka mirror etc. He started calling certain devotees who had been with him since he first came to America and started giving away things that he was personally using and of course there was a mixing feeling. They were happy to receive his gifts, but at the same time they were very sad also. These types of things were going on and more, which I can’t really talk about, but there was much discussion about Prabhupada going to be with Krsna. At one point that was even a meeting. He told the GBC to have a meeting and decide whether he should stay or go. I don’t know…I look back at these things and I think that Prabhupada was just playing with us like a kid bouncing a ball – he was just bouncing our hearts, making us just more attached to him. Then everybody shouted, “Jaya!” They were very happy. There were many incidents like that – some of them gave life to the devotees, some of them seemed to give life to Prabhupada for sometime – but progressively, from just before the Mayapur Festival until November 14th 1977, it was the pastimes of departure. It was more than anybody could understand – it probably still is, but it was quite exceptionable. Several days before Srila Prabhupada left, he wasn’t eating anything, and then the devotees became more concerned and worried, so they called the kaviraja (Ayurvedic doctor). In the evening Prabhupada had been silent for many hours and the kaviraja felt his pulse and expressed to the devotees that this was maybe Prabhupada’s last day. When that news went around, things became almost chaotic. My Indian visa had just expired so I had to go back to the United States about two weeks before, so on that evening I wasn’t there. I was somewhere else in the United States, preaching. We all have to depart from this world and Prabhupada was adamant to show that our shelter is not in modern science, it’s not in any other form of concoction – our only shelter are Krsna’s lotus feet, the Holy Name of Krsna and the association of the Vaisnavas. That’s the only shelter that we should seek. He used to say that when you are young, you should make a program for recovery, but when you get old, make a program for departure. That was his model. Prabhupada would sometimes sing the prayers of King Kulashekara – “Now while I’m young and strong and with clear thinking, let my mind grasp the lotus feet of Krsna. In this way, let me go from this world – not when I’m old and I can’t think and my mind becomes senile.” This type of mood was in him everyday. On two different occasions, Prabhupada gave babaji-vesa to two young disciples who thought they had some disease and were going to die. He told them go to Vrndavana and chant Hare Krsna. But later they got some medicine, got cured, gave up their vesa, gave up chanting Hare Krsna, went back to the world and got jobs. Yes, those men thought they were dying, but after 50, you shouldn’t think you are dying – you should KNOW for sure you are dying! After 50, that’s what’s waiting. It’s the end. You’ve crossed the line. It’s downhill from there. When you’re young, you might think you might die, but when you’re old you should know for sure. You don’t get another 50 years – it is very rare. Only in lakhs of people, one lives to be a hundred. Maybe in 100 lakhs, one person lives to be a hundred.